Papua New Guinea government’s hope to see a clean city in the lead up to the Apec summit in November has met action from the National Capital District Commission. 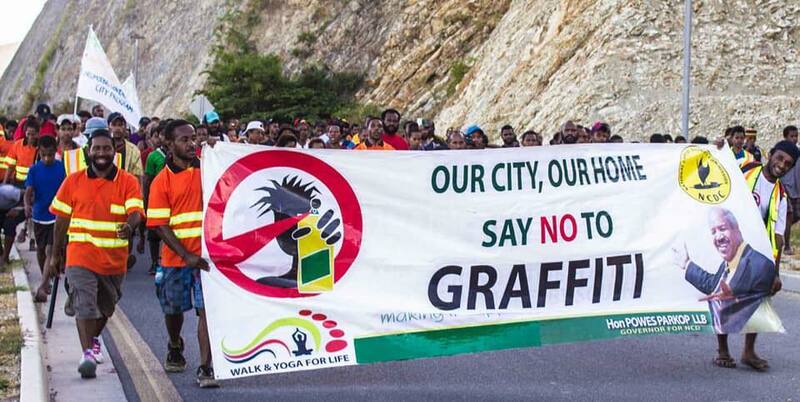 The campaign on anti-graffiti started on Sunday morning to achieve the desired outcome for the meeting and to leave a legacy for the future in which our Cities can all be litter free. It was witnessed by NCD Governor Powes Parkop and other participants of Walk and Yoga for Life today at Paga Hill ring road in Port Moresby. Mr Parkop said its taskforce was already established to partner with the Minister for Lands and Physical Planning and APEC Justin Tkatchenko for the cause. The campaign was coupled with a live painting of the governor showing how the art of graffiti can be used in a good way to beautify the city. The members of the taskforce assured the commission and others that they have got the solution to rid the practice in the city. Governor Parkop said they have tried their best to get rid of it so to achieve a graffiti-free city for all despite its challenges. He admitted that graffiti has defaced properties and the image of the city, reiterating his call for ban on sales of spray painting and tougher penalties for its artists. Thousands of taxpayers’ money had been wasted to counter it, he said. Crowd drawn by Active City Development program’s Walk and Yoga for life provides a forum to do awareness for action on many development issues affecting both the city and the country, he said. This coming weekend the Active City Development Program will focus on activities to promote the World Environment Day.